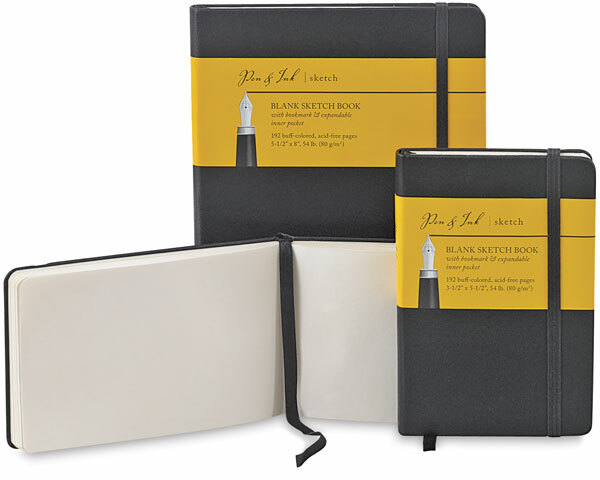 For artists and notekeepers on the go, these durable hardbound sketchbooks and lined journals are excellent for sketching, writing, or taking notes in pen, marker, or pencil. Each book includes a bookmark, an elastic closure, and an expandable inner pocket for holding business cards or clippings. Graph Sketchbook, 96 Sheets — Contains 96 sheets of acid-free medium-weight 54 lb (80 gsm) graph paper. Blank Sketchbook, 48 Sheets — Contains 48 sheets of acid-free heavy-weight 98 lb (145 gsm) paper. Lined Journal, 96 Sheets — Contains 96 sheets of acid-free medium-weight 54 lb (80 gsm) lined paper. Blank Sketchbook, 96 Sheets — Contains 96 sheets of acid-free medium-weight 54 lb (80 gsm) paper.